Queen converges many powerful possibilities just in a graceful look. It is a beautiful Responsive Shopify theme that’s written with smooth and modern HTML5, it looks and works great on mobile devices, tablets and computers. 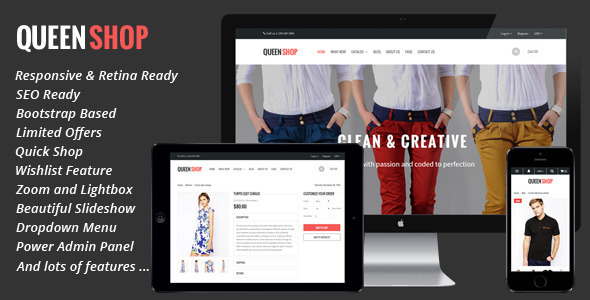 Perfect for stores of any kinds, such as fashion, clothing, digital gadgets, furniture etc… Queen is easy to customize, fully responsive, and is loaded with useful features. Let’s sell products in your own way now! Check out the online demo. - NEW FEATURE: Added two new colour pre-sets. - NEW FEATURE: Added the SUPER Mega Menu. - NEW FEATURE: Added the vertical menu on homepage. - Other minor bug fixes and improvements. We tread on the heels of Shopify. If you need any extra or feature just email us and we will include it in the next update.